Model DRZ-PH-O™ Quick, Clean, Quiet. 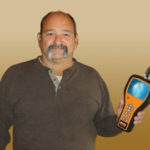 Looking for a cleaner way to clear clogged drains? The Model DRZ-PH-O is the answer. 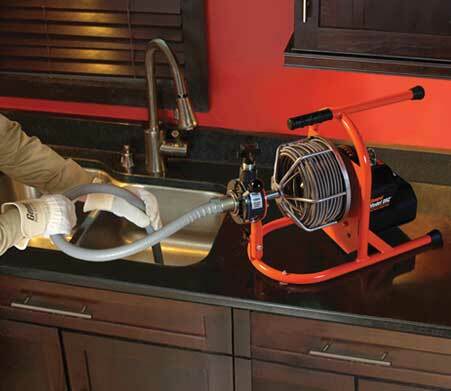 Light and powerful for a machine of its size, the Model DRZ-PH-O is ideal for clearing clogged sinks, tubs, and laundry drains in 1-1/4″ to 3″ drain lines up to 50 ft. long. The variable speed power cable feed gives you complete control as it feeds and retrieves the cable at up to 16 ft per minute. The four foot guide tube means you never have to touch the cable so your hands, and the jobsite, stay clean. Operate the machine horizontally on the kitchen counter or vertically on the floor next to the tub. The silent motor is powerful enough to clear the line quickly yet won’t disturb your customers while on the job. 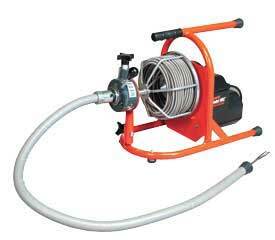 Use the pneumatic pedal to keep your hands free to control the feed and guide hose. The open cage drum carries up to 50 ft. of 1/4″ or 5/16″, or 35 ft. of 3/8″ Flexicore wire rope center cable. Units with 3/8″ cable include our five-piece HECS cutter set. Weighing as little as 30 lbs. the lightweight machine is easy to handle. Use the carrying handle on top to carry to and from the job. Clears clogged sinks, tubs, and laundry drains in 1-1/4” to 3” lines. 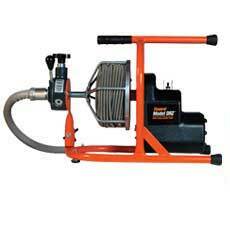 Variable speed power cable feed drives and retrieves cable at up to 16 ft. per minute. Four foot guide tube keeps hands, and jobsite, clean. Powerful yet silent motor spins cables up to 50 ft. down the line. Quick-change cable cartridge system allows clean and easy cable changes. 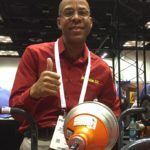 Rugged rust resistant aluminum drum can carry 50 ft. of 1/4″ or 5/16”, or 35 ft. of 3/8” Flexicore cable. 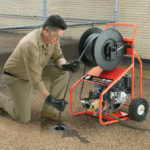 The silent motor is powerful enough to clear the line quickly yet won’t disturb your customers while on the job. Operate the machine horizontally on the kitchen counter or vertically on the floor next to the tub. Variable Speed; Drives 1/4″, 5/16″ and 3/8″ cables. 20 ft., 3 wire; equipped with ground fault circuit interrupter.